Mlodinow never fails to make science both accessible and entertaining. Leonard Mlodinow is a theoretical physicist and author recognized for groundbreaking discoveries in physics, and a passion for making science accessible and interesting to the general public. He was on the faculty of Caltech, and is the author of five best-sellers. Among them, The Grand Design, co-authored with Stephen Hawking, took the reader on a tour of the latest ideas in physics and cosmology, and reached #1 on the New York Times best-seller list. His book Subliminal: How Your Unconscious Mind Rules Your Behavior, described how a person’s thoughts, decisions, and feelings are profoundly influenced by the behind-the-scenes operation of the unconscious mind, and won the PEN/E.O. Wilson award for literary science writing. And his book The Drunkard’s Walk: How Randomness Rules Our Lives showed how the hidden forces of randomness have a huge and generally unrecognized affect on all aspects of life, as well as the course of companies and societies. It was chosen as a New York Times notable book, and short-listed for the Royal Society book award. Dr. Mlodinow is also known through his many contributions to journals such as The New York Times, Wall Street Journal, Scientific American, Nature, and Psychology Today, and public lectures and media appearances on programs ranging from Morning Joe, to Through the Wormhole, and for debating Deepak Chopra on ABC’s Nightline. He also wrote for the television series MacGyver and Star Trek: The Next Generation. Read more ..
From the best-selling author of Subliminal and The Drunkard’s Walk comes a groundbreaking look at the psychology and neuroscience of change, and at how tapping into elastic thinking will help us thrive in the modern world. Drawing on cutting-edge research, Leonard Mlodinow takes us on an illuminating journey through the mechanics of our minds as we navigate the rapidly changing landscapes around us. Out of the exploratory instincts that allowed our ancestors to prosper hundreds of thousands of years ago, humans developed a cognitive style that Mlodinow terms elastic thinking, a unique set of talents that include neophilia (an affinity for novelty), schizotypy (a tendency toward unusual perception), imagination and idea generation, and divergent and integrative thinking. 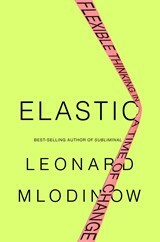 Read more about Elastic..